The boys’ mother, Emily, died in 1893, in her early thirties. Their father, Albert, remarried in late 1899. His second wife was Annie Baker from Reading, born c1875. Their marriage was registered in Eton. 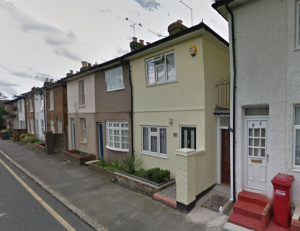 In 1901 the family was living at 97 Alpha Street, Slough. The three boys, Albert, James and Fred, were with their father and step-mother and they had a new half-sister, Midi, born earlier that year. By the time of the 1911 census, the three older boys had left home but their family had grown. Parents Albert and Annie were living in Egham at 85 Hythe Park Road, off Thorpe Lea Road. Midi had been joined by five more siblings: Ernest (born 1902 in Ashford), Beaty (1904 in Staines), Emma (1906 in Datchet), Rosa (1908 in Thorpe Lea), and Doris (1910 in Egham). The children’s birthplaces indicate that the family was moving around, perhaps following their father’s work. 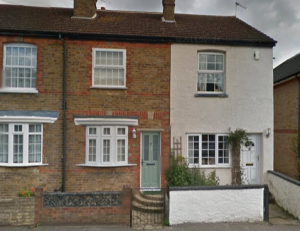 As two children were born in Datchet, Albert in 1886 and Emma in 1906, this indicates the family lived in the village at least twice. Their aunts Miriam and Emily also lived in the village. Fred wasn’t with his family for the 1911 census. 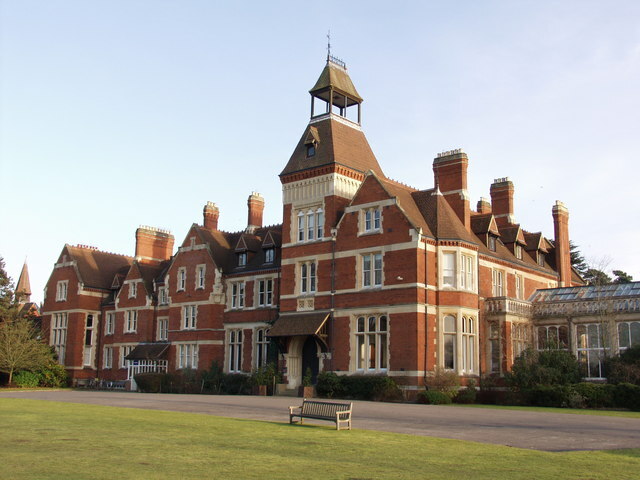 He had joined the military and the census recorded him at Hounslow Barracks. He was a 20-year-old Private in the 5th (Reserve) Battalion, Royal Fusiliers. At some point Fred transferred to the 2nd Battalion as Bandsman/Private L/14431, Royal Fusiliers, City of London Regiment. Records indicate that in August 1914, the 2nd Battalion was in Calcutta (now Kolkata) in India. Was Fred with them there? They returned to England in December and joined the 86th Brigade, 29th Division at Nuneaton. They were training for France when orders arrived to prepare to depart for Gallipoli. Fred’s much older cousin, William George Gray, (born 1868) was also in the 2nd Battalion. 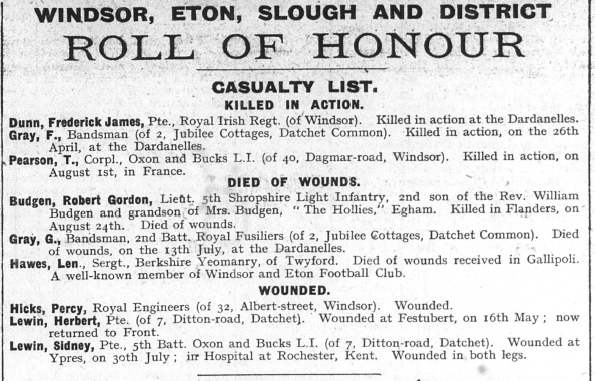 Both men are remembered on Datchet’s WWI memorial. 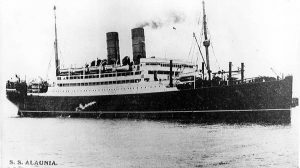 The 29th Division was inspected by the King near Dunchurch on 12 March 1915 and four days later the 2nd Battalion embarked on SS Alaunia at Avonmouth, near Bristol. They sailed to the Eastern Mediterranean, stopping for a few days in Malta before heading to Lemnos where they stayed until 26 March. From there they continued to Alexandria, arriving at noon on Palm Sunday, 28 March. 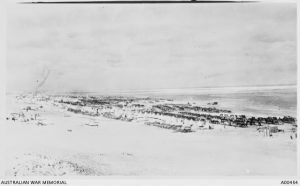 The troops proceeded the next day to Mex Camp, a transport and holding facility, and over the next few days they practised disembarking and attacking enemy positions. They returned to Lemnos on 11 April and on 23 April, the 2nd Fusiliers left with the covering force for Tenedos where final preparations were carried out. 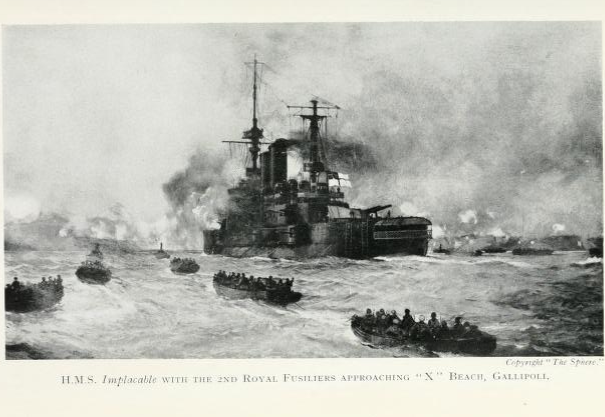 The 2nd Battalion was then split; two Companies, W and X, with headquarters, went aboard HMS Implacable, and Companies Y and Z went aboard a mine-sweeper. About 10.30pm on 24 April, in bright moonlight, they began their approach to Gallipoli. Around 3.30am the following morning, the men aboard Implacable were given a hot breakfast. The fleet bombardment began at 4.45am, and Implacable steamed into position half an hour later. The objective for the covering force was the capture of Achi Baba, the main position occupied by the Ottoman-Turkish defences. The 2nd Battalion landed at ‘X’ beach, a small natural amphitheatre on the north-west of the peninsula. Here a narrow strip of sand was shadowed by the cliff which rose some 100-feet up from the beach. When their boats grounded, the men jumped into the water and waded ashore. Weighed down and slowed by wet clothing and equipment, they clambered up the steep cliff under the protection of covering fire from Implacable. At the top of the cliff, the 2nd ran into heavy converging fire but managed to seize one of the Turkish trenches. That was the extent of the Battalion’s success that day. The Turks were well prepared and the Fusiliers’ objective was never realised. The 2nd suffered heavy losses and was reduced to half-strength. For more details, The Royal Fusiliers in the Great War, by Herbert Charles O’Neill, contains a chapter about the 2nd Battalion at Gallipoli. Fred was reported missing, presumed killed, on 25 April 1915, the day he landed in Gallipoli. He was 24. 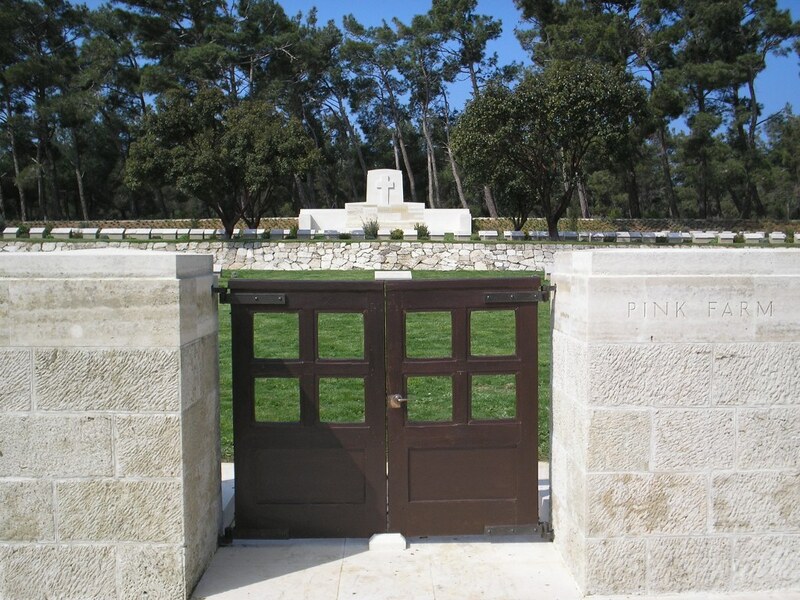 He is remembered at Pink Farm Cemetery at Helles, Turkey. The farm took its name from the red soil in the area. There are now 602 servicemen of the First World War buried or commemorated in this cemetery; 250 of the burials are unidentified, but special memorials commemorate 219 casualties known or believed to be buried among them. Fred is listed on Special Memorial 149. The inscription reads: ‘Their glory shall not be blotted out’. Frederick Charles Gray was awarded the Victory Medal, British War Medal and 1914-15 Star. 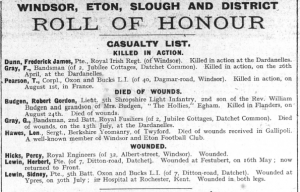 Confirmation of Fred’s death was reported six months later in the October 1915 issue of Datchet’s Parish Magazine, at the same time as the death of his cousin, William George Gray. 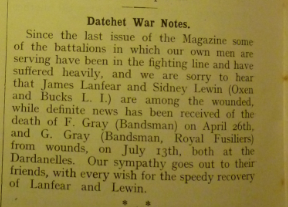 “Definite news has been received of the death of F Gray (Bandsman) on April 26th [sic], and G Gray (Bandsman, Royal Fusiliers) from wounds, on July 13th, both at the Dardanelles. Our sympathy goes out to their friends…”. Fred’s ‘Soldiers Effects’ document in his military records tell us that his father received £8 19s 9d after Fred’s death. 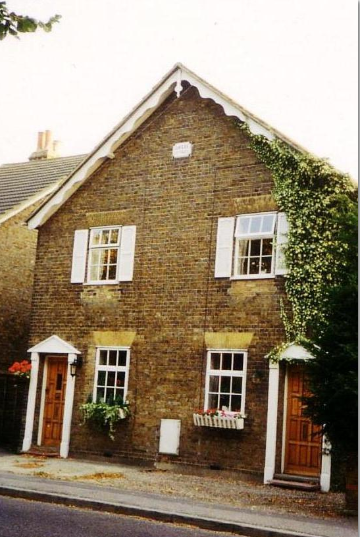 In the newspaper, Fred’s address is given as 2 Jubilee Cottages, Datchet. This was the home of his aunts, Miriam Phyllis Gray (born 1844) and Emily Gray (born 1864). Miriam and Emily were sisters of Fred’s father, Albert, and his cousin William George’s father, William Charles. In the 1871 census Miriam’s family was living in a cottage at Wheeler’s Yard, in the Royal Village in the Great Park. The adjacent households included the gamekeeper’s house, the Royal School, carpenters, workshops and other cottages. This suggests they were employed by the estate. In that census, 27-year-old Miriam was still living at home and was described as a thistle picker. This employment, at such a late age, suggests that she perhaps had a low IQ or learning difficulties of some kind. In the 1881 census, at the age of 37, she was still with her parents at Wheeler’s Yard. 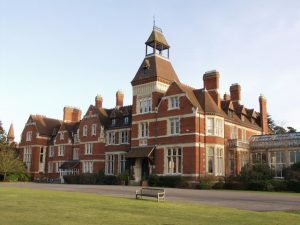 In the following censuses, 1891, 1901 and 1911, Miriam was living at Jubilee Cottages in Datchet with her sister, Emily. There was a 20-year age gap between the two women and Miriam is sometimes recorded as widowed, other times single. Emily is similarly recorded as either her sister or her daughter. Both were working as laundresses. Jubilee Cottages (number 2 is on the right of the photograph) were substantial modern houses built in 1887, the year of Queen Victoria’s Golden Jubilee, so Miriam and Emily must have moved in soon after they were built. The 1910 rate valuation confirms that Miriam was the occupier and it was owned by a Mr J Dean of Chelsea who had no other property in the village. It was at a time when whole blocks were often bought and sold by absentee landlords or local developers. The Grays sometimes had a relative or lodger living with them but it’s not yet undertood how they were able to pay the rent on their wages as laundresses. 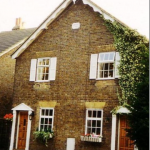 Neither is it understood why Frederick’s contact address was listed as 2 Jubilee Cottages especially as his father was still alive in 1915 unless, perhaps, his father was moving frequently with his work and Aunt Miriam’s address was a constant. Evidence hasn’t yet been found to show that Fred or his cousin William George spent much time in the village.